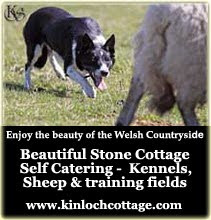 Away To Me, the documentary about sheepdog trialing is about 10 days away from being ready to purchase. I saw this movie at a screening in August and really enjoyed it - read my review HERE. The DVD's are going to be only $19.95 USD plus shipping and handling. They have included bonus material of Bill Berhow's full winning run with commentary by Bill and the judge, Bob Washer. 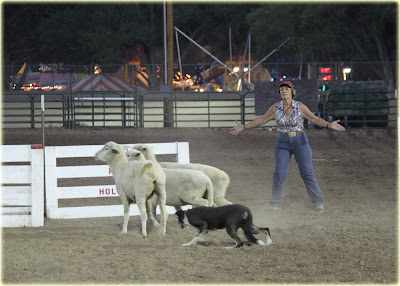 www.sheepdogmovie.com and drop in at their facebook page for more information. Trailer.mov from Andrew Hadra on Vimeo. The DVDs of the 2012 National Finals are now for sale. This year they have a few different choices. You can order your individual runs, just the semis, just the finals or the whole thing. The prelim runs were taped by Geri Byrne and the semis and finals are the same as the web cast, minus the interviews. We just put our order in. I've said before that I think broadcasting and, in turn, producing dvds of the Nationals is a very important thing. First off, it is a way to preserve our breed. The finals always used to be video taped by Rural Route Video's, Martin Penfold, who also went across the pond and video taped the Internationals. 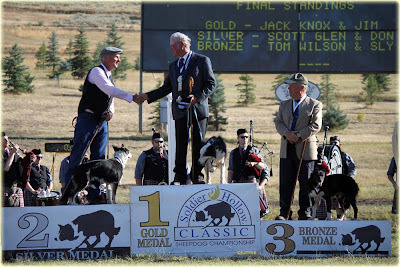 After I got Laddie, I was able to buy the 1994 International and see his grandfather take reserve champion. 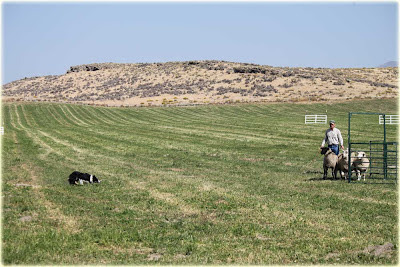 I also saw Johnny Wilson's Spot win it and was able to see the striking resemblance to several of his great grandpups that Scott had trained. He is also my Hemp's great, great grandfather. I wish someone had taped back when Tommy Wilson's Roy was running so I could see Ford's great great grandfather. Not only is it a neat experience to see these great dogs and compare them to their descendants but I also think it is an invaluable part of preserving the history of our breed. Rural Route quit filming the year that Scott won the Nationals with Pleat (2004) and I have no visual record of that victory - not even any photographs but I love the fact that I will have a copy of June's semi finals win this year at 3 years old. The other thing I like about the taping of the finals is so that I (ie Scott) can critique my run. Usually, when someone offers to tape my runs it is a curse. The run ends up being so bad that there is nothing to learn from it. A crossover, a grip or just plain old never getting to the sheep. People ask if I want to see what they taped and I say, "NO. Why do I want to relive that 30 seconds of torture?" This year, my semi finals wasn't good, but had things I could learn from and I really want to see it again. I thought it was Laddie's fault. Scott had a different opinion. 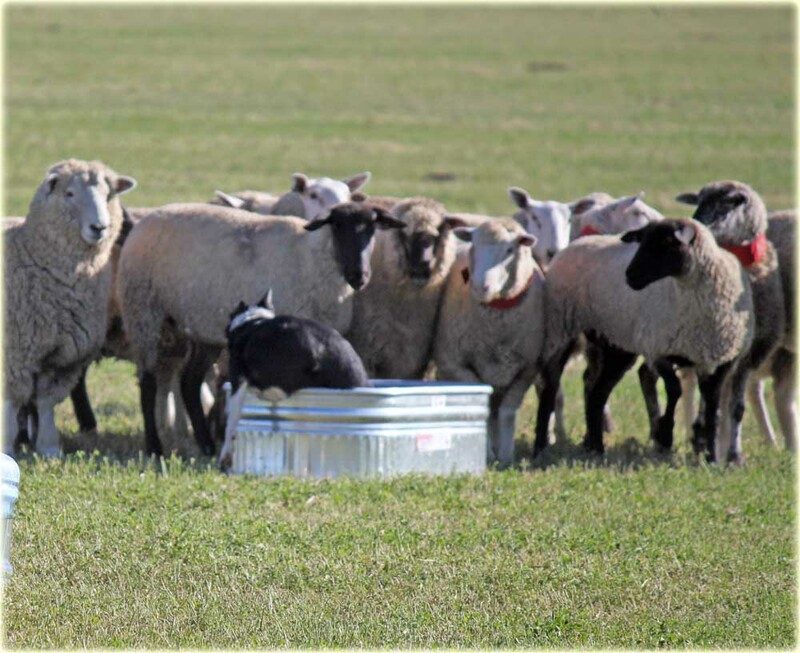 It's important for my growth as a handler to find out exactly what happened. I learned so much by Scott going over my Carbondale run last year. 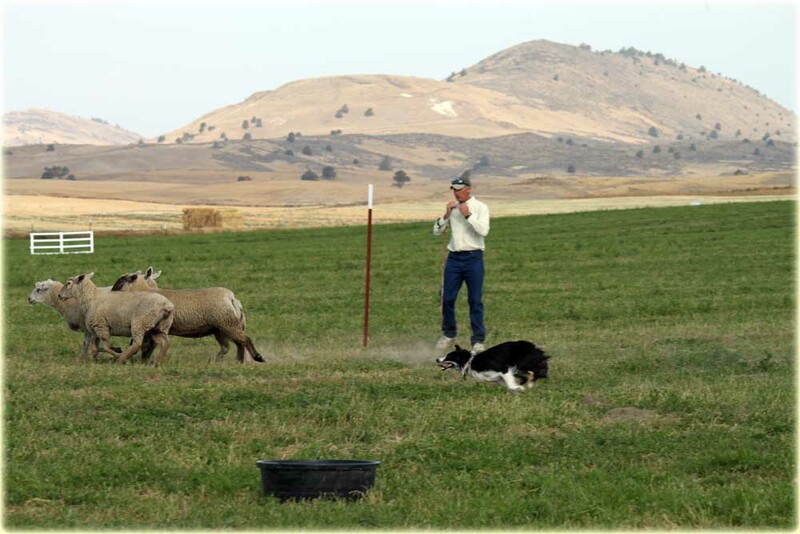 I think it made a huge difference in how I handle the Western sheep now. I am lucky to get to go to the finals every year. 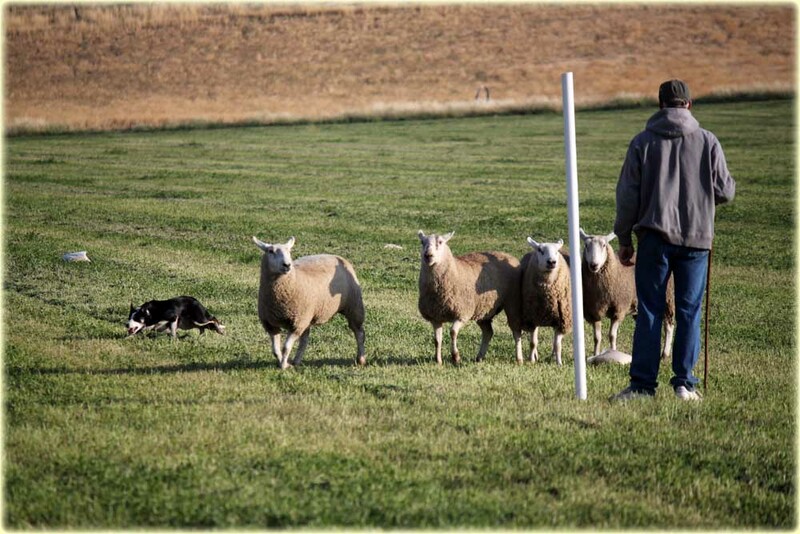 I get to see the other handlers and dogs and have my own opinion on what I like. 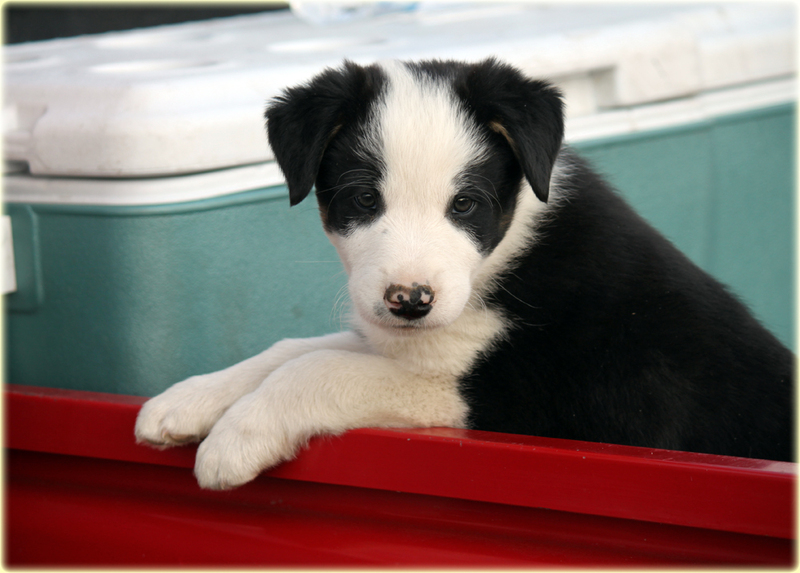 If I was at home, I would consider the webcast a great way to help me choose a dog I might breed to or buy a pup out of, and help me choose a clinician based on how they handle their dogs and how their dogs respond. The general consensus with the webcast was that people wanted it to be free. The USBCHA helped fund this year's "free" webcast so we could all enjoy it. Part of how they are going to recoup that money will be based on how many dvds they sell. It will also be a major factor in their decision to film it again next year. I urge you to support them and buy a dvd of this year's finals. (a good Christmas gift!) Put it on your shelf. 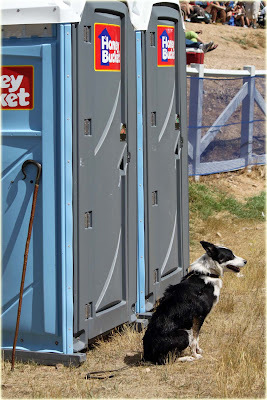 You never know when you might want to see those dogs again. The double lift this year was broadcast on a live streaming so I hoped you watched. 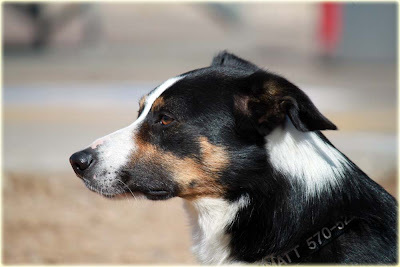 I always think it is important that everyone have a chance to see what is happening at a finals and how the dogs perform even if you are too far to go. Just looking at stats on a page doesn't always tell you the real story. In the double lift, it was very important to draw up early. 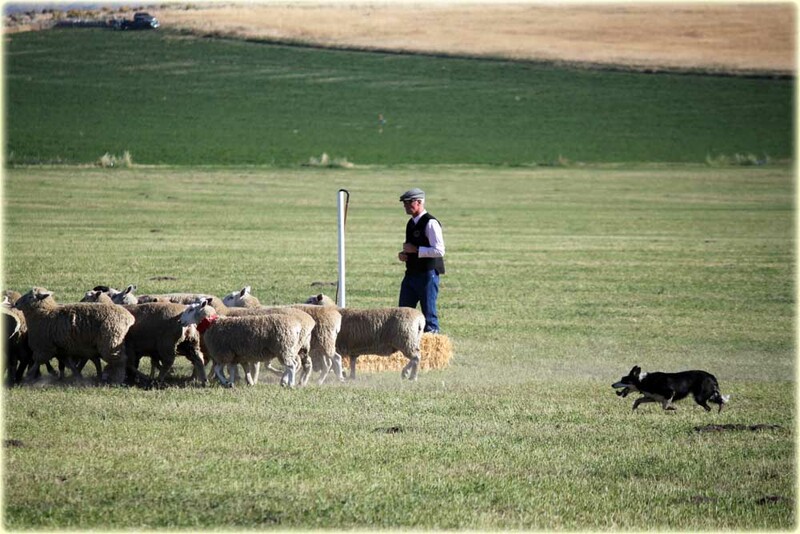 It was so dramatically cooler in the morning and that affected everything - how the sheep behaved, how the sound traveled and how much you could ask your dog to do. I'd like to say that since June drew one of those coveted spots, that she won the trial but she didn't. It was a little over her 3 year old head, but she behaved admirably. 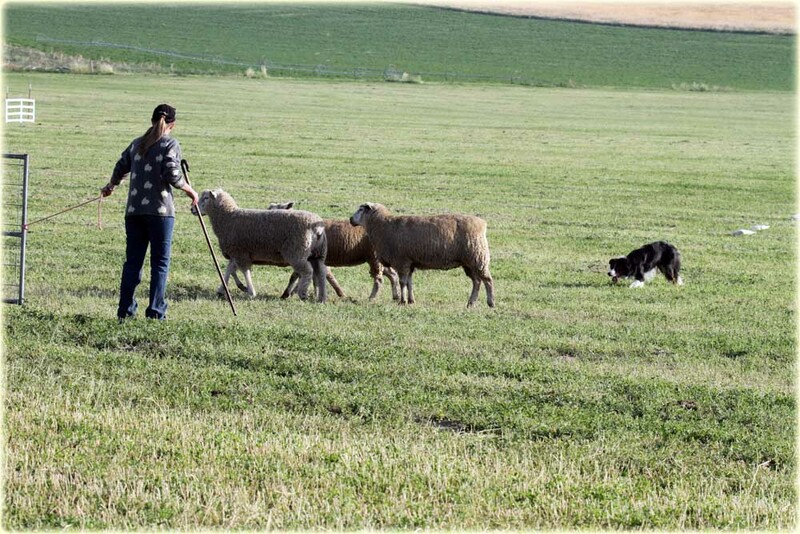 June's sheep (and a few other runs had the same problem) drifted so far away while she was busy picking up her second set of sheep, that when she was ready to pick them up again, she had another 300 yard outrun to do so. While she was regathering her first set, (on her third outrun) her second set found the water by the judges tent. June got them all together and slid into the water, right under their noses to get a dip. Several sheep tried to join her and I have to say I am proud of her for not gripping them and getting called off. When Scott asked her to get out of the water and move the sheep along, she did with no fear or temper grips. 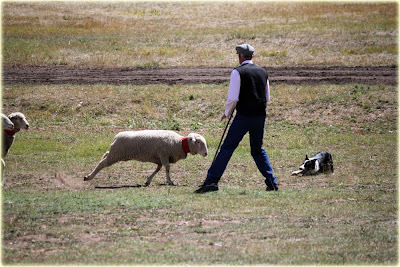 Unfortunately, that restraint wasn't rewarded when she was called off in the shedding ring for defending herself when a grumpy ewe tried to hit her. 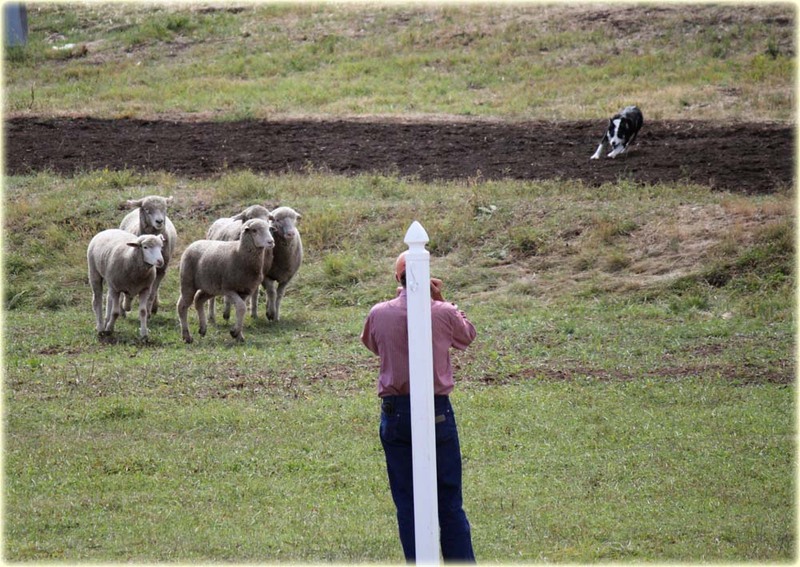 One judge felt it was good dog work and did leave her on but the other three judges quit scoring her so the points were only a lowly 93. That's why the live streaming video was so good to have. Without it, you only see a 93. With it, you saw heart and drive that you can't see in her score. We are proud of her and she can certainly chalk this trial up to a learning experience. If only... If only... Donnie had drawn up in the morning. 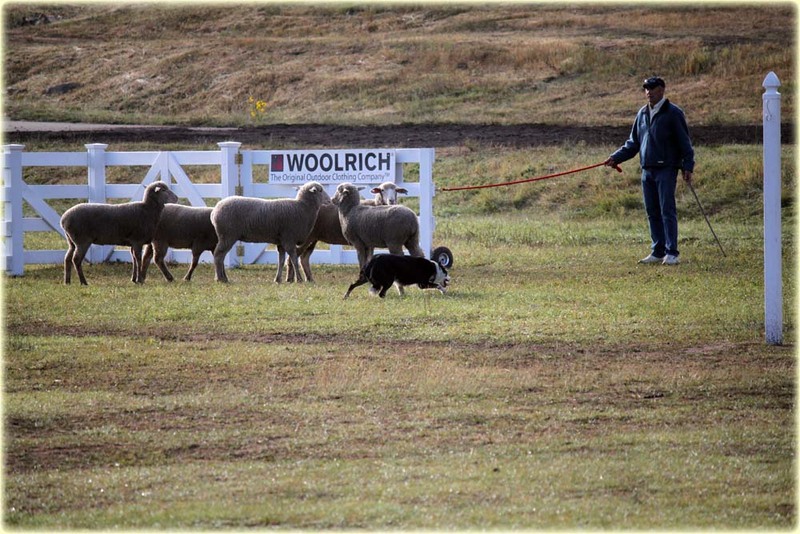 But that's dog trialing. 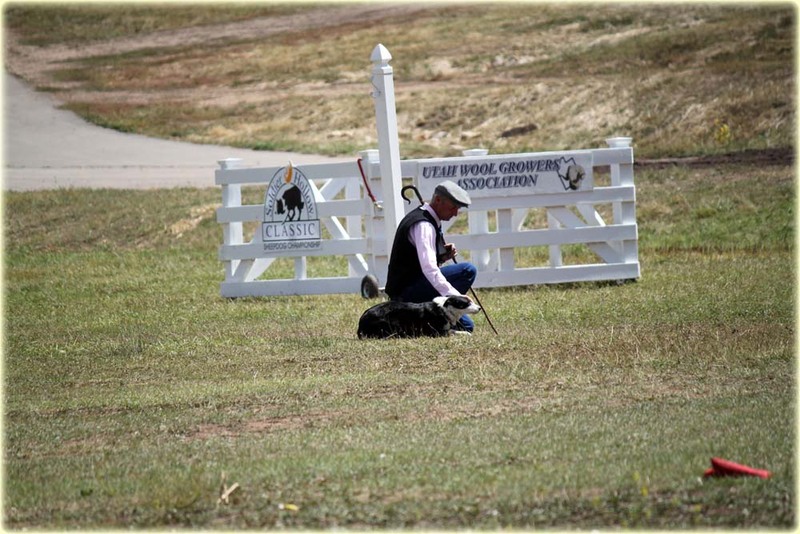 Donnie's experience would have really helped him do well if he hadn't had to run in the heat. It wasn't that Don got overly hot. Quite the opposite actually, his stamina was far better than I ever knew. It was that the hearing on the field with the second set of sheep just went to pot in the afternoon. More than one dog was lost and straining to hear their handler's commands to no avail. This happened to Don also. Scott set him up for a wonderful swallow tail turnback that he took like a good thing, and he bent hard to the left the way he should. But going back blind, he needed just one directional bend and when it was time to get it, he was already too far into the no sound zone for him to hear it. Scott spent alot of time and points trying to communicate to him where they were. 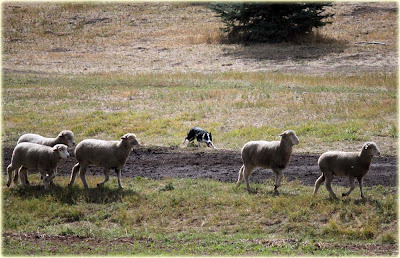 He finally found them but when they pulled hard to the handler's left (they were very determined to get to the nursery exhaust which was in the same field and where alot of them had already been - knowing it was a place of water, shade and no dogs) he couldn't hear Scott well enough to get where he needed to be to make that dog leg fetch. The line was terrible but he did his job and got them to Scott anyway. The drive was amazing. Donnie never took a break to go to water during the entire run, even after all of that but never looked too winded on the drive. It was smooth and they were quiet and calm sheep that walked into the shedding ring, with less than 3 minutes to get the shed. That's just not enough time and so that was all she wrote. I have to say, I'm Donnie's biggest fan and with the obvious exception of Scott, I know him better than anyone, and he impressed me even more by how deep he dug within himself to do his job today. I hope Klamath Falls invites us all back in a few years when they have recovered from this one and we'll now be setting our sights on Virginia for the 2013 Nationals! I hope you all watched the on line feed today. They did a really good job and it was free! Assuming you all did, I will just give a brief mention about how it went. Of course, Scott will tell you that he'd rather give up the win today to have a win tomorrow and I will be keeping my fingers crossed and sitting on pins and needles, probably forgetting to breathe while he runs them. Laddie, Laddie, Laddie. It takes both of us to get the job done. Sometimes it's me, sometimes it's him. Today it was him. He got lost on his outrun and I gave him a couple of redirects to widen him out. Then he went too wide and tried to go get the exhaust sheep from the nursery field. 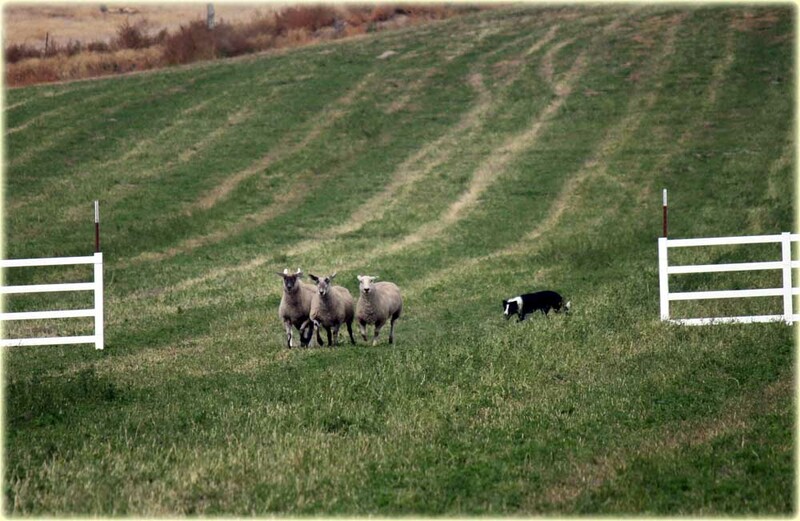 Fortunately, there weren't any there and I was able to get him back to the correct sheep. After that, it just wasn't very good. He was just kinda late on getting over on his flanks. We made our fetch panels and actually had not a bad drive away making the panels nicely but had a pretty sloppy crossdrive and just missed the panels high. We again had a good shed, and this time a nice pen but when I called Laddie in on the single, he came in and held it good enough for most trials but this is the Nationals and they wanted a little more so they didn't call it. We tried one more time before the time ran out and ended up with a 113. 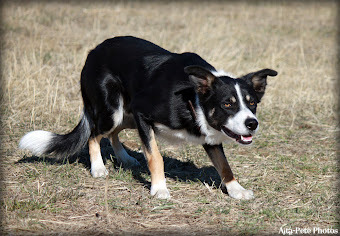 I thought we'd be the last dog with a score but actually we weren't and we ended up 28th overall, which is nothing to brag on but it's higher than I've ever been at the finals. 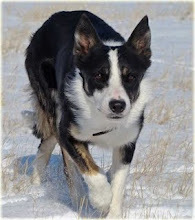 Laddie will probably be an old dog by the time I get in the double lift but we'll keep trying. 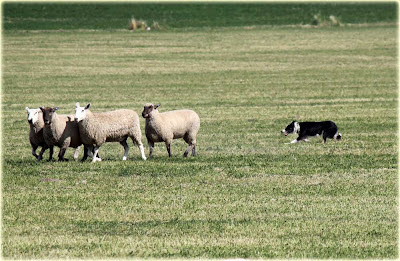 And in his defence, alot of dogs didn't listen to their handlers when they told them where to find the sheep and had to retire early. Lad did listen, and got there, and perhaps getting lost is what put him off his game. I knew the single was going to be a problem ahead of time. Spoiled dog will probably still get to sleep on the bed. They will do a draw tonight for the finals order tomorrow so all I can tell you right now is to tune in at 8AM and see who runs when. Oh, and a big shout out to Brian White from California (his wife has the Honest Dog store with really cool border collie themed clothing) who is in his first finals and made the double lift today! Scott and I are really proud of him!! The day is not over yet and neither is the first round of the 2012 National Finals but I decided to blog now because I will likely be going out to dinner later. I think I am safe enough to say that Don, June and Laddie will all be returning tomorrow for the semi finals round! Donnie's run today was just beautiful. 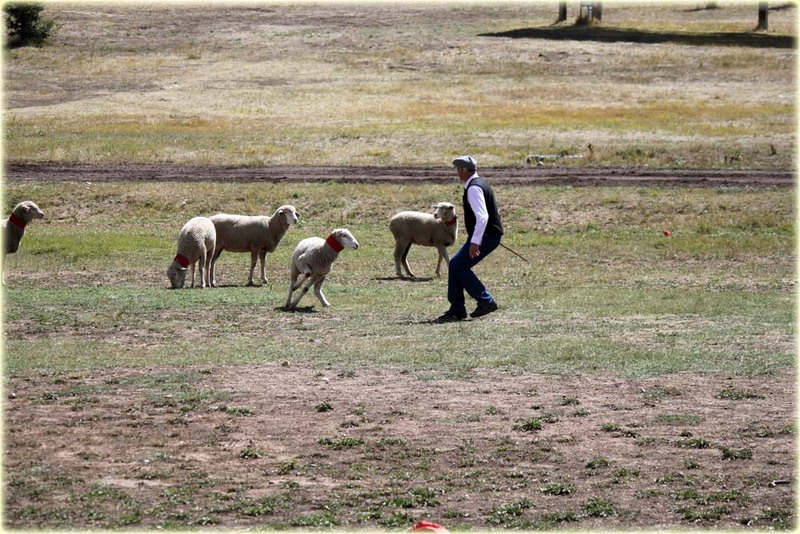 It was hot and the sheep were turning into very determined beggars. 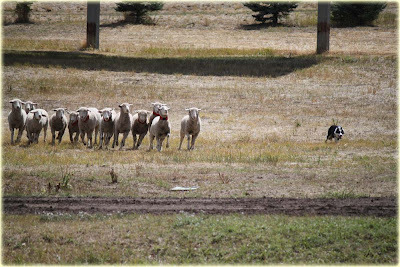 Many dogs appeared to hear but with the pressure the sheep were putting on them, they didn't want to let go and flank off or push on them to get them on the line. Scott sent Don to the right and he came in deep behind the sheep. It seems that if you get ahold of the sheep within the first 20 yards, you will be ok, but if not, you will rarely recover. Don had some work to do moving back and forth at the top to hold the sheep but he got them broke and they were very nice the rest of the way around. He had straight lines and was smooth all the way around, making all his panels. It took a little bit of time before Scott got a shed lined up for Don to come through on but when he finally opened a gap, Don came in and took a hold of the situation. After that, it was a fairly easy pen and they ended up with a score of 162! It was the highest score of the trial at the time but as this afternoon goes on, a couple more have topped him with Amanda Milliken in the lead right now. No matter, they are more than well into the semi finals. 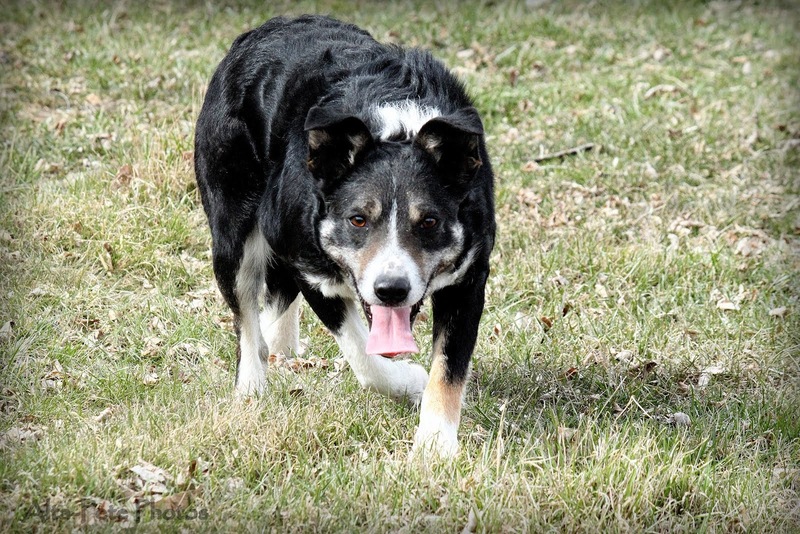 but Bliss walked them the whole way around and made both her fetch and drive away panels. 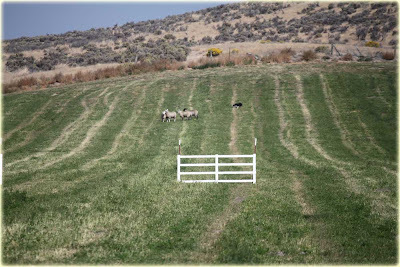 They had a great crossdrive going but right before the panels, the sheep had a burst of speed up the hill and missed them high. They moved on and had a good pen. Their score was a 140.5 and that placed them in 11th overall! Good job, little Bliss! 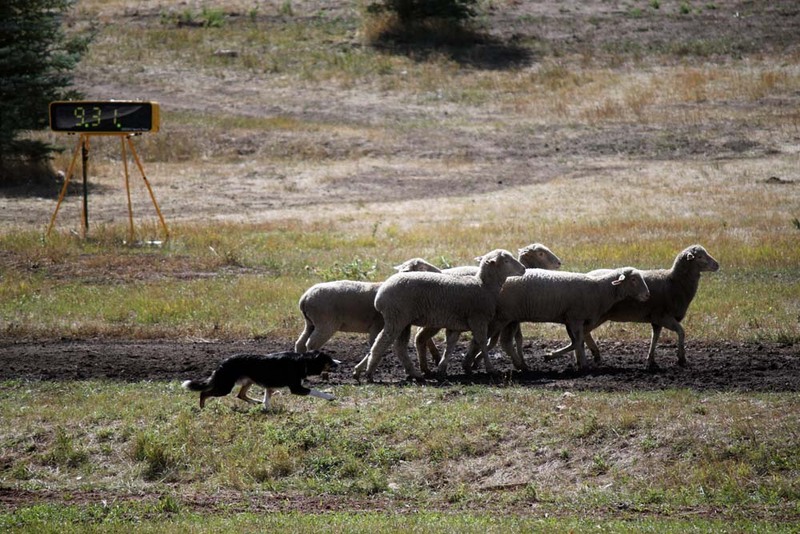 It was pretty hot when Wynn ran his last nursery run and in the words of one handler, "there had been much carnage" by the time his turn came. He actually ran very well but his set had wandered quite a bit off the drop point by the time he got there. 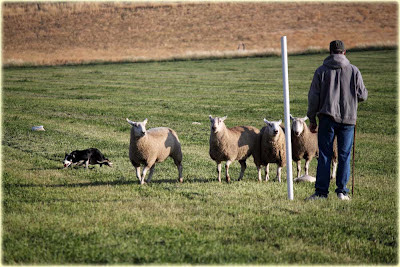 Unfortunately, that meant that Wynn's first contact with his sheep was him having to run like hell and get into their faces to turn them to try and make the fetch panels. 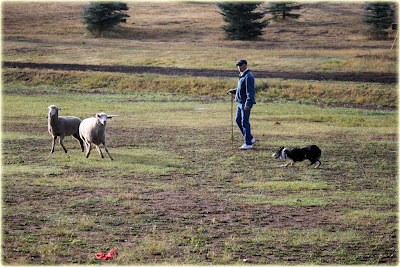 He missed by just a little bit but by then, his sheep were running and Wynn was having to work hard to just contain them. It was a wide turn around the post and then on to a very quick drive with the panels made. 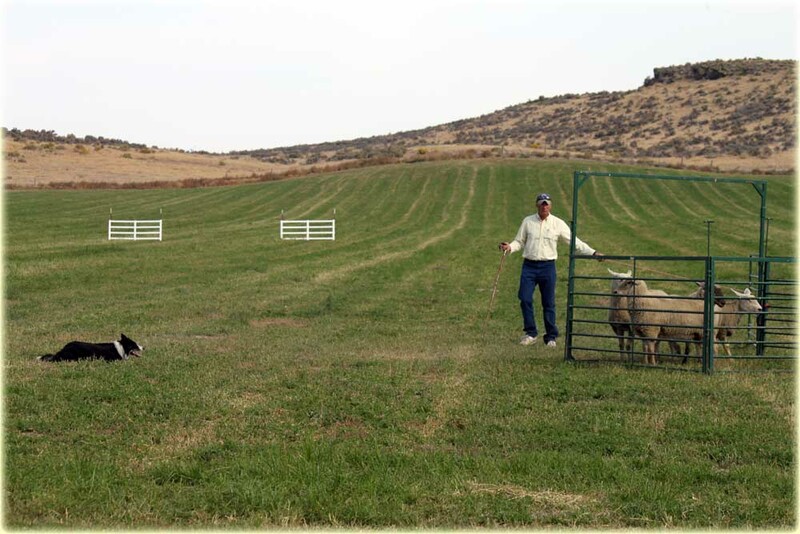 Halfway across the crossdrive, things settled down but Scott missed that panel again on the high side when the sheep fooled him and took a quick jump up the hill right in front of the gate. It didn't take long for them to pen with Wynn enthusiastically trying to help Scott get them in. They got a 135.5 and that finished up 12th overall! 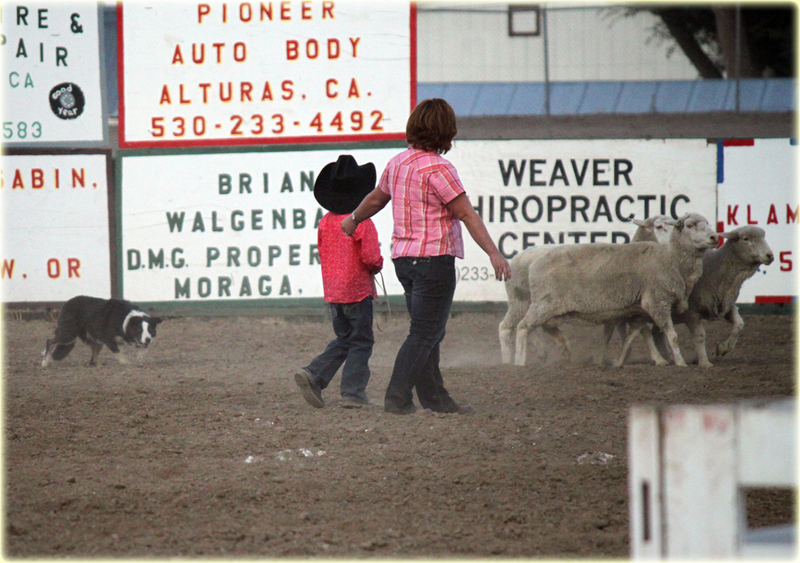 Wynn will be leaving us when the finals are over and going home to his owner, Diane Pagel. I will miss him very much. 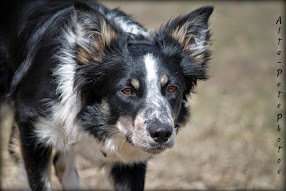 Diane imported him from Wales and had him sent directly to our kennel when he was 8 months old and Scott and I have been mummy and daddy ever since. I know Diane will love him. He's a good boy. The facebook page for the nationals has some information but since they are posting so quickly on the finals website, they decided to just let that be the place to get the scores. There is only WiFi in the open tent and everyone posting information is a volunteer so please be patient and they will get the info out as soon as they can. This morning was nice and cool just like the last few days. 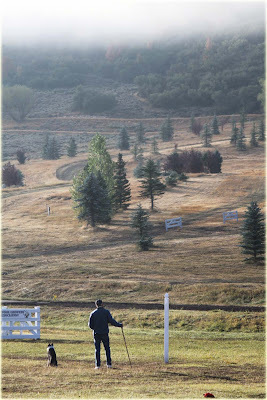 I was happy since I was running Laddie 4th up in the morning. Scott ran June at that time the morning the day before and it turned out well. (the hearing seems to run out in the afternoon). 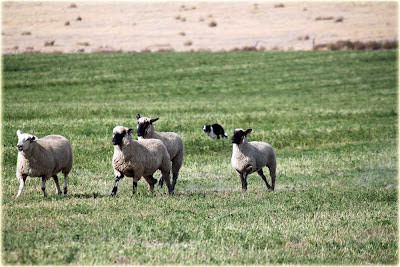 Scott gave me strict advice not to flank too fast on these sheep and not let Laddie bring them too fast. I was sure I was going to be ill walking to the post, especially when I was hoping to send Laddie to the right and he wouldn't look down the field. 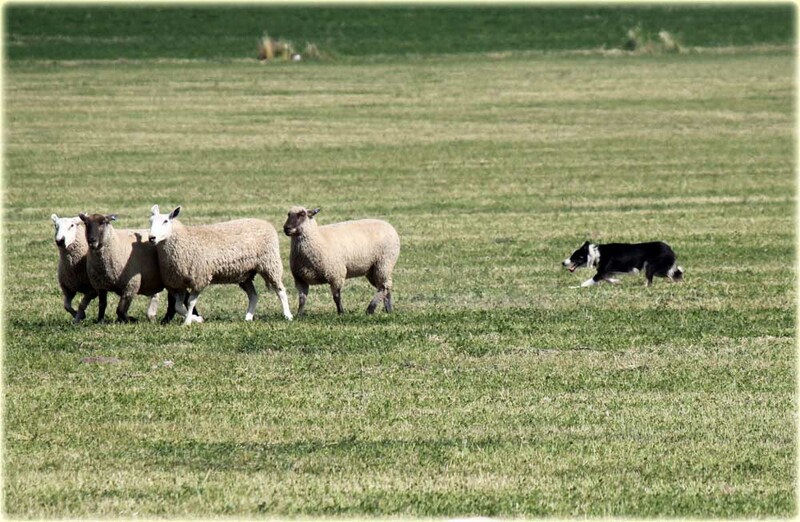 He had seen the sheep down the field before our run but when we got to the post he was sure the sheep were hiding in the barn to the right of the field. Nothing I could do would convince him otherwise. I put him on my left and he spotted them just fine. I didn't want to send left though so I put him back on my right and he wanted to go to the barn again. So. There was nothing for it and I sent him to the left. 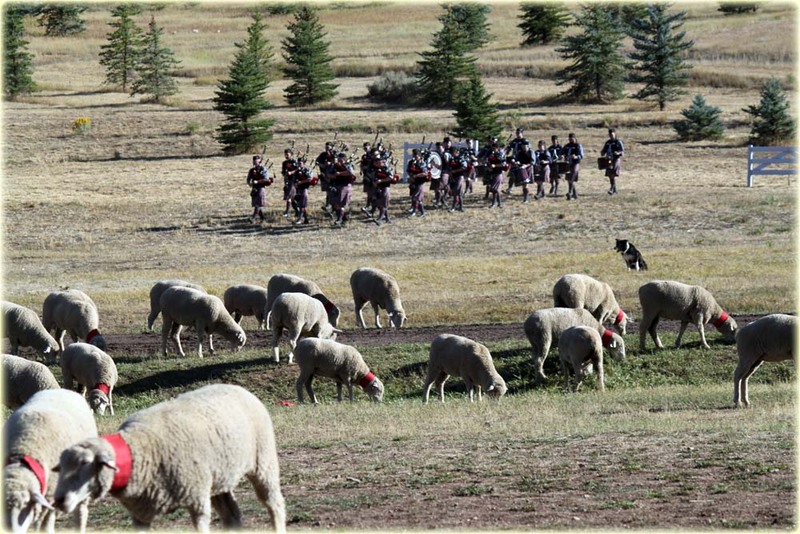 It turned out to probably be a good idea because the sheep were often running off that way anyway. He started his lift and I could see there was something funky going on up there but wasn't really sure because I couldn't see that far. 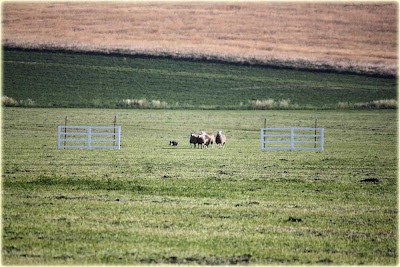 It looked like one sheep was just going to finish her breakfast and not move on with the others. He had some sort of talk with them up there (and thank goodness he didn't get angry) and they moved on. They were a little off line on the fetch but straightened out and made the panels. We had a nice turn around the post, if not a tad wide and started off on a straight and calm drive away. So many people had cut that panel short so I made sure I was very deep before I turned Lad on the crossdrive. Only, I wasn't deep through the panels. I wasn't through the panels at all, and turned them short. I decided not to dwell on it and moved onto the crossdrive. 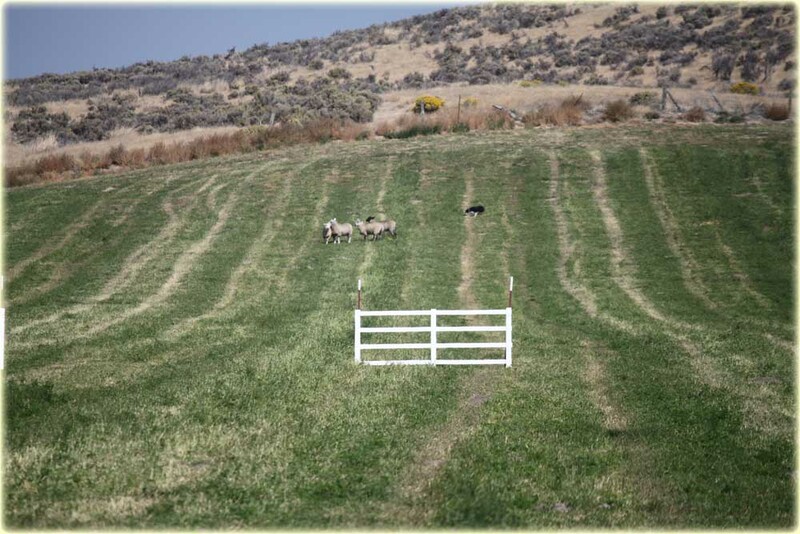 Scott had warned me not to make too many adjustments on that line so we kept it to a minimum and fortunately, the sheep were helpful in making the panels. We had a good 3rd leg and moved into the shedding ring. I took a deep breath and prepared for the fact that I was likely not going to get it called. 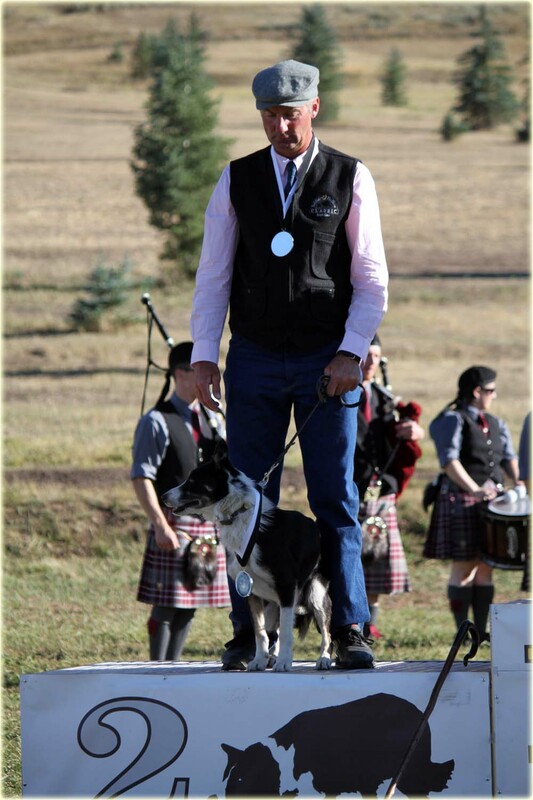 The judges did not want too much man and Laddie needs help that way. I made a big gap for him, stood still and called him in. He came right in and turned on his sheep! 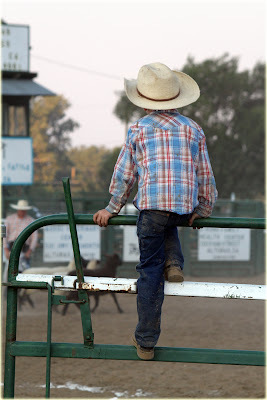 I walked up behind him to keep him engaged until the judges called it good and we went on to the pen. 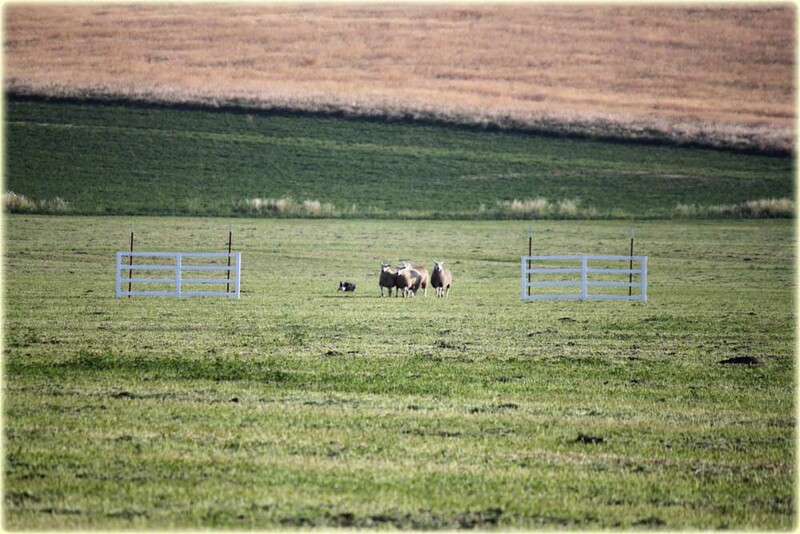 It didn't take us long to get the pen but before I closed the gate, they popped back out again. They did that 3 times before I ran in, with less than a half a minute left, and got the gate closed. We scored a 141 and should be good to make the semis! Wynn ran in nursery in the afternoon. Scott sent him to the left and he went wide but didn't get stuck on the set out pens. 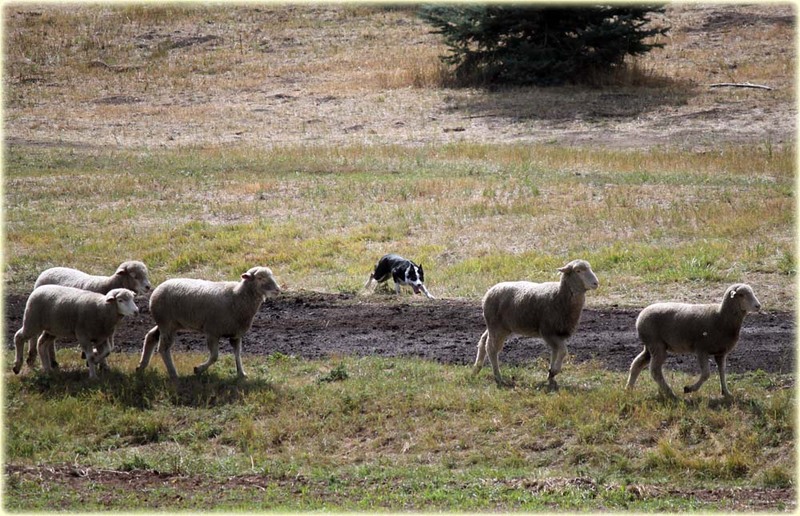 He went by them like a good dog and came in deep behind his sheep. He didn't stop on his lift as Scott asked, but he didn't rush them either. They had a nice line on the fetch and made the panels. 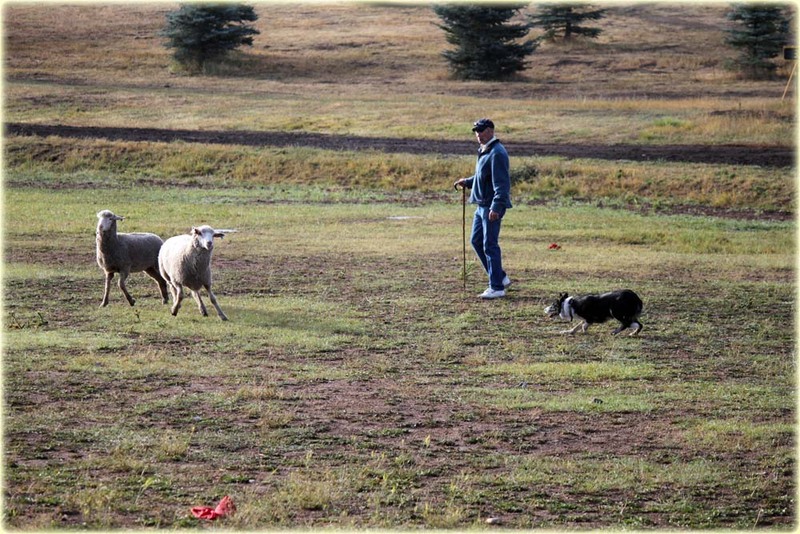 The sheep liked Wynn much better than they did Bliss and were waiting on him. The turn was good and it was a great drive away line to and through the panels. The sheep started to pull to the set out as they went through the gates and Scott flanked him to turn onto the crossdrive. 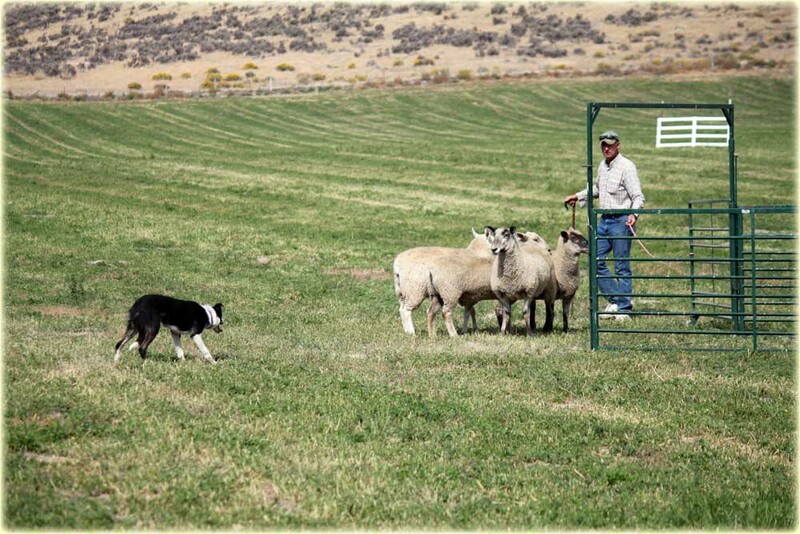 It would have been a good turn but Wynn got a little worried about the pull and over covered, causing the sheep to go back through the panels. They moved onto the crossdrive line and made the panels well. 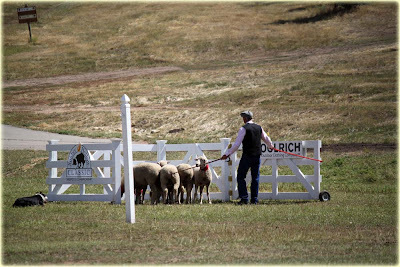 They had a good line to the pen but when they got to there, Wynn got jumpy and started to push on the sheep. There were a couple of times where he tried to grip but Scott got him stopped before there was any misdeeds. Unfortunately, they ran out of time before they got the pen and scored a 128.5. Both Wynn and Bliss will make the second round of the nursery tomorrow but unfortunately, it is a combined score to win and with the leader, Lyle Lad, sitting with a 163 on one dog and a 158 on the other, the best they can do is try to improve their placings. Donnie drew up in the afternoon tomorrow. 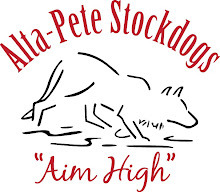 Today that was a very bad place to be and many a very good handler ended up with a DQ or RT because there was no hearing. We are hoping that the same doesn't happen tomorrow. The Klamath Falls crew always puts on a great show. There are more vendors coming all the time (it's all about the vendors isn't it? ), and the hospitality is genuine. In the past, there had been complaints from handlers about the dust, so they have a water truck spraying down the isles between the rows of campers. There had been complaints about the mosquitoes, so this year they actually sprayed for them. And, there had been complaints about the smoke from local fires so they made sure they got them extinguished in time for our arrival. The weather gets down right cold every evening so that your camper never gets too hot, and it warms up every day so you don't have to watch the runs all bundled up and shivering. They thought of everything. Yesterday was the first day of running and I think we all realized that it wasn't going to be that easy. It's not that the sheep are belligerent or heavy. 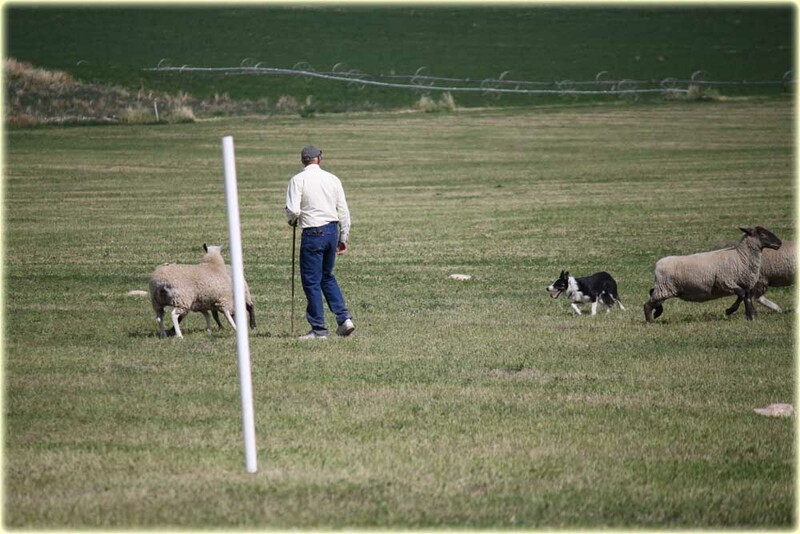 Its just that they aren't going to run around the course in a straight line for you and the judges in the open (Alasdair MacRae and Michael Gallager) are going to make you work for a good score. 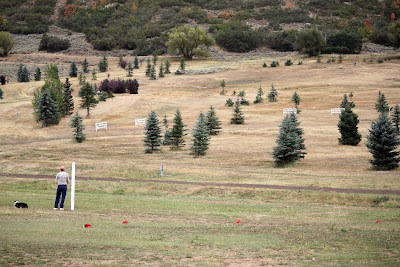 Yesterday the top score was a 150 by Erin O'brien layed down by her at the end of the day. I missed it but I hear it was a beautiful run. 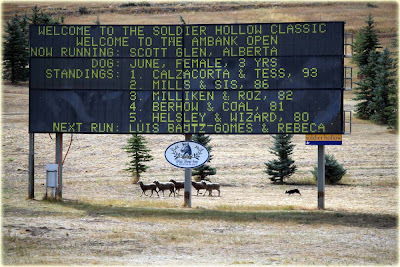 The other two big scores were a tied 148 with Amanda Milliken and Roz and Don Helsely and Ash. This morning, Scott ran June and she didn't disappoint. 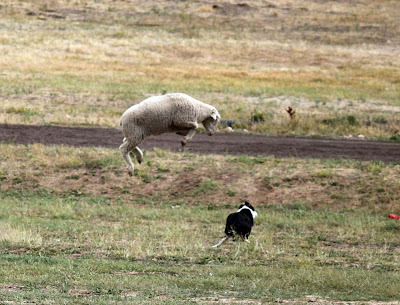 Her outrun was a tad big and the sheep were quite a ways off the set out spot by the time she got there. She didn't help her lift when she came in short but Scott put her over and all went well after that. The sheep can be touchy at the panels and Scott had to do a couple of quick flanks to make sure he got the fetch gates but June's speed came in handy. They had a tight turn around the post and started off on a good drive. They made the panels with not too big of a turn and marched across the crossdrive. June looked good, confident and smooth. They were a little tiny bit high in front of the crossdrive panels but a small movement put them through. Unfortunately, it was a deep turn and they had to work to get them back on the line. 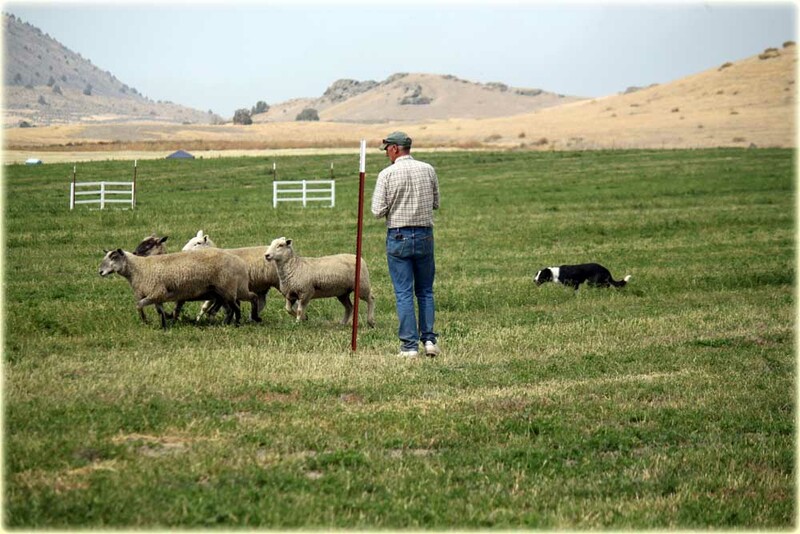 When they got into the shedding ring, Scott lined up the sheep, and when he saw a gap, he stepped in and called in June, keeping everything calm and not taking any chances. Instead of taking a point or two for what maybe was considered too much man (that's the only thing we could see wrong with the shed) the judges didn't like it and called for Scott to reshed. 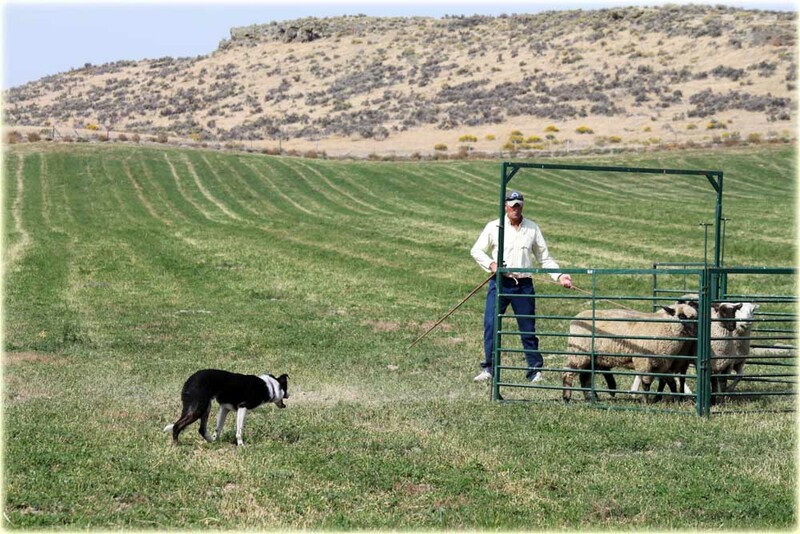 Very quickly and efficiently, he and June put the sheep back together and did it again. This time the judges accepted it. ( I really really fear my shed with Lad now) Scott and June did a very nice pen, making it look easy. Several people came up to me and told me what a beautiful run it was. They scored a 148. It should take them to the semi finals. and that is where it gets a little tricky when, after the drive panels, the sheep want to bolt to the set out. The dog's need to make an away flank to catch them and put them on line to drive to the crossdrive panels on our left. 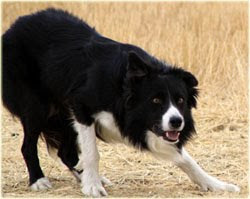 However, the dogs believe it would be faster to go downhill to catch them instead of up hill and they end up taking and incorrect comebye and crossing their course. 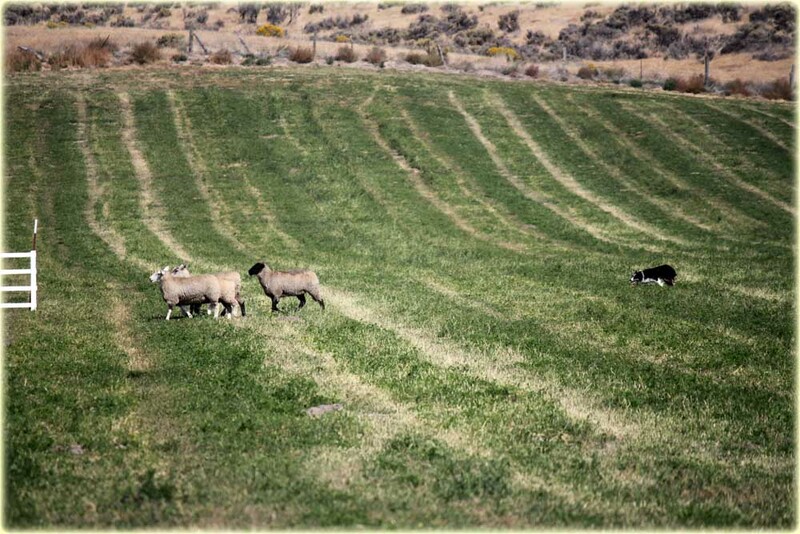 Bliss tried very hard to get in the favor of these sheep but they felt she was too quick on her movements. She stayed way back on the fetch but it still didn't make them happy. After making that drive away panel and doing as many others had by crossing her course, she struggled to get them back on the crossdrive line and didn't have a very good crossdrive. When they approached the pen, Bliss had to be on the handler's side to turn them into the mouth. 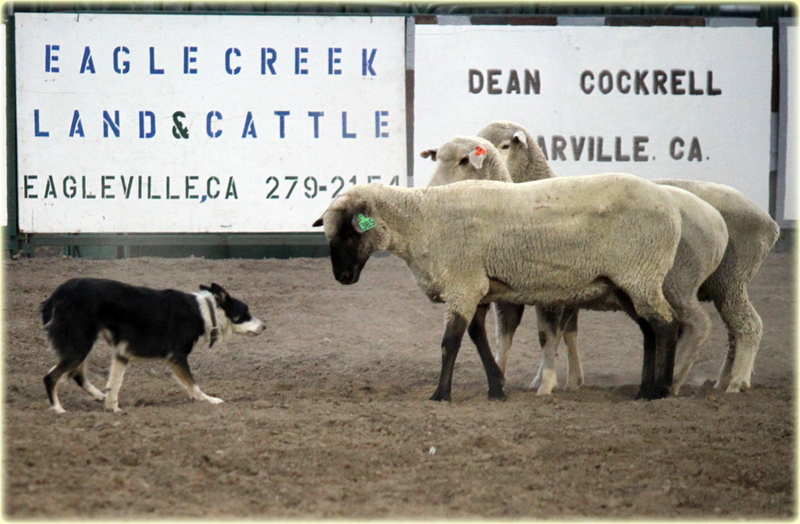 Fortunately, she has a deep, fast flank that got her to the other side when it was time for her to work her own side. 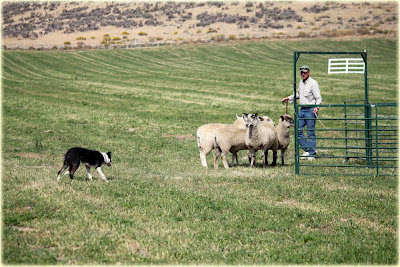 After convincing one particularly jumpy black faced sheep that she had no choice but to go in, they closed the gate with a score of 128. It put her in 8th place for the time being but they will finish up the class tomorrow. No one knows how many will be going back for a second run but Lyle Lad is the clear leader with a 163. The winner will have a cumulative score for both rounds so Lyle will be difficult to catch. From a personal point of view, I was rooting for Ron Enzeroth and his young Pete dog who is a half brother of my Ford (from Tom Forrester's Pete). They ended the day in 4th! 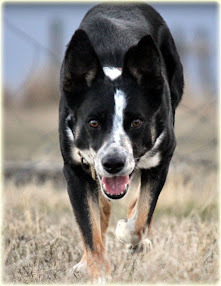 Laddie and I run in open tomorrow, 4th up in the morning. It's a very good time to run. I really hope I can keep from wasting it. Scott and Wynn run tomorrow in nursery and Donnie will finish up the open on Friday afternoon. First things first! Congratulations to Jack Knox with Jim for winning the 2012 Soldier Hollow Classic. Scott's run is probably better told in pictures so I have put quite a few up here but I'll just mention a little about it. He had a good first outrun with one very nice bend out (it was common to give a few of them) and a good fetch. He had difficulty on his turn back and on his second fetch his sheep tried to join up with the first lot waiting at the bottom of the field while they were still at the top of the field. So his fetch lost quite a few points. After that, they had a nice drive and a good shed but when they got down to one they had trouble cutting her out - well, they didn't have trouble cutting her out, they just had trouble keeping her out. She kept coming back. 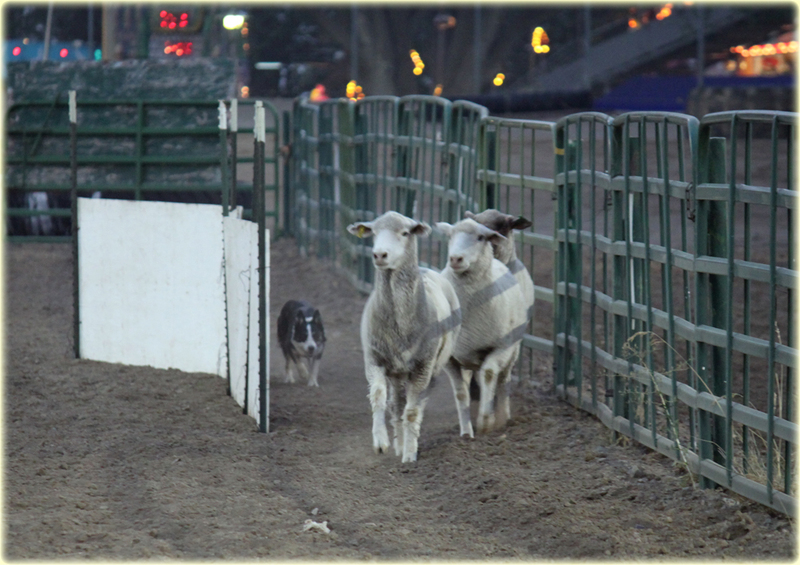 Once they got her out, they had a nice pen and ended up with the silver medal! Tommy Wilson and Sly (rumored to be retiring this year) took home the bronze - congrats, Tommy! Another run worth mentioning was Faansie Basson's with Don. It was a very nice run. Scott and Don ran early yesterday and knew it was a do or die situation. This was their last chance to get into the double lift. Donnie didn't disappoint. 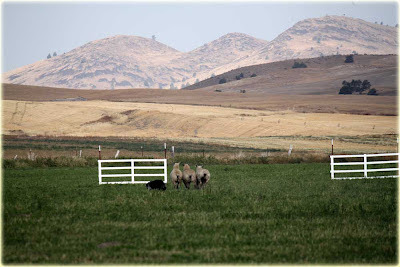 The sheep were happy and cool in the early morning as a fog rolled over the tops of the hills. Donnie kept them that way. They didn't mind him as he gently moved them around the course, put them through the panels and walked them on the lines. In the shedding ring, there was only a little bit of shuffling before they opened a hole up for him to walk through and hold them apart. When they got to the pen, they tried to make a couple of breaks for it but Donnie caught them and pushed them back in to the mouth for Scott to scoop in. It was a beautiful run and earned them a 95 to top the day and get into the double lift. June ran a little later in the day. It looked like she had learned her lesson about how to get up the hill and started out on a nice outrun. However, as she got to the top, she went a little deep and spotted the set out pen and got stuck up there. Scott had to call her back and call it a day. His only comment was, "How was she going to be any help rustling sheep if she only brought me the 5? She was helping me by bringing the whole flock." Lori Cunningham ran Matt in the early afternoon too. 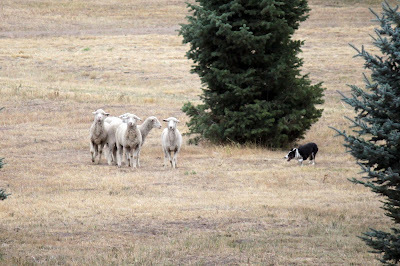 Matt had been a little perplexed the day before by these western sheep that were different than anything he had ever seen. Yesterday, Lori kept him moving and didn't let him get careful and even though the run didn't end up placing, Matt looked much better. It was of particular interest to me because his little brother, Ford, is my next dog and I was wanting to see if that line of dogs was going to be able to handle these sheep. Matt showed that with a little practice, there was nothing to worry about. 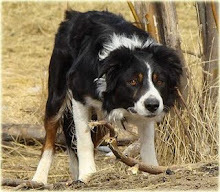 Last, in the afternoon, when it was hot, I ran Laddie. I can't tell you how proud I was of our run and yet just as disappointed. Lad went out a little wide on the outrun which made me think he was not happy about getting to his sheep but that was a premature thought. When he got up there, I gave him one flank to the comebye and a lift whistle and he brought them right on down the line and through the panels. A nice turn around the post and we both checked our patience and took it easy moving the sheep up the dangerous drive away line, keeping the sheep from dashing off to the nearby exhaust. The wind picked up as we went through the panel so I leaned into it and blew for all I was worth to help him make the turn and start on the crossdrive. I hollered his name twice to loosen up his inside flank and keep the sheep on the line and before I knew it we were in front of the next panel. 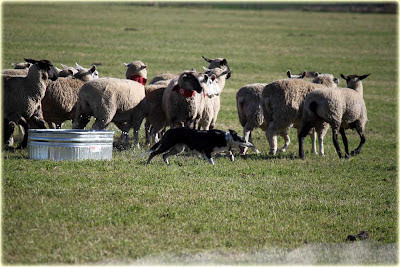 A little wrestling with the sheep and we got them through, back on the third leg of the drive and into the shedding ring. I had 5 minutes to finish and I panicked. It was a run that was going to put me in the finals. Probably challenge Scott for first if I finished clean and I had never run such a nice run. But that was where it ended. In my haste to finish the shed, I pushed on the sheep. One girl was trying to get to the exhaust and I ended up losing her and she promptly jumped the fence with her buddies following. The sheep are winning against us. Once again we didn't get a dog qualified for the double lift. It was June's chance today. Despite June not scoring, she did better than we expected. 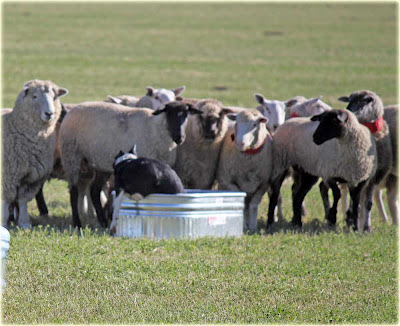 I must confess, we thought these sheep would make her mad enough to bite right from the top but she didn't. 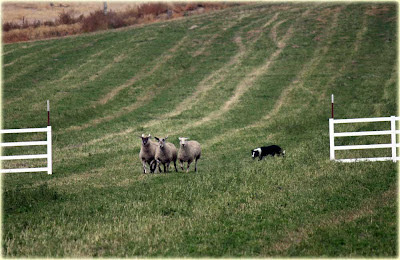 She lifted nicely and controlled them at the start but got off line before the panels as the sheep tried to bust back up the hill. 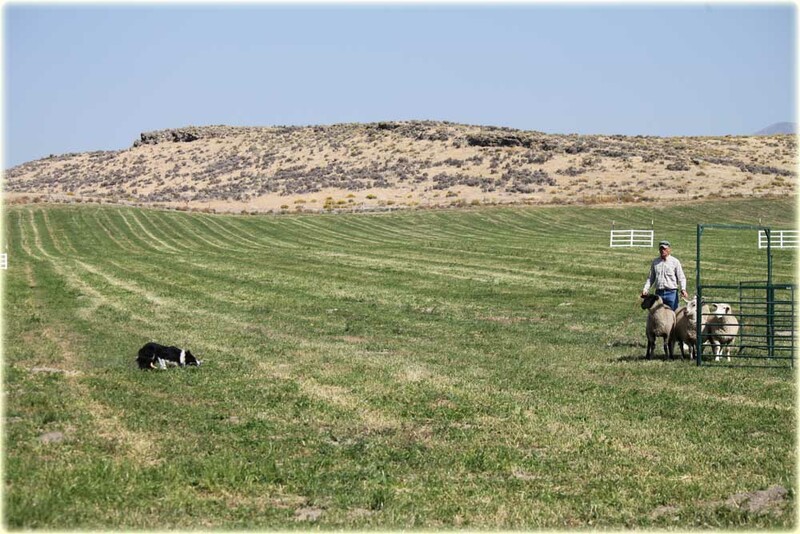 June made her fetch panels and continued on down the hill and made a good turn. 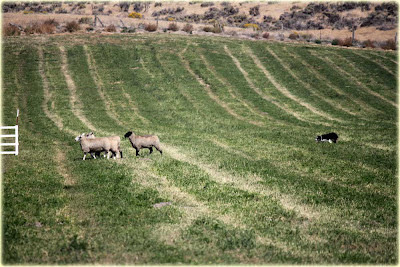 The sheep tried to string out on the drive line because the front three were hoping to make it back up the hill again but the last two were content to stop and graze. June worked her tail off to keep them all moving and still didn't grip as she hazed them through the drive panels. They got off line a little on her crossdrive, moving low on the hill and they made the crossdrive panels with some difficulty. June brought them into the shedding ring on the line and they had a quick shed. 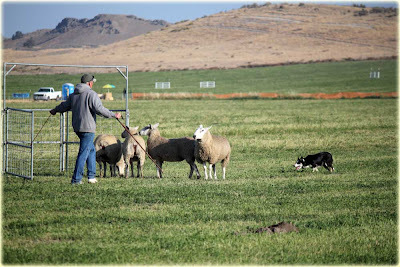 They hurried to the pen and Scott got the gate open with time to get it finished but on the way, June gave a quick low grip on the hock, just like her dad did the day before. 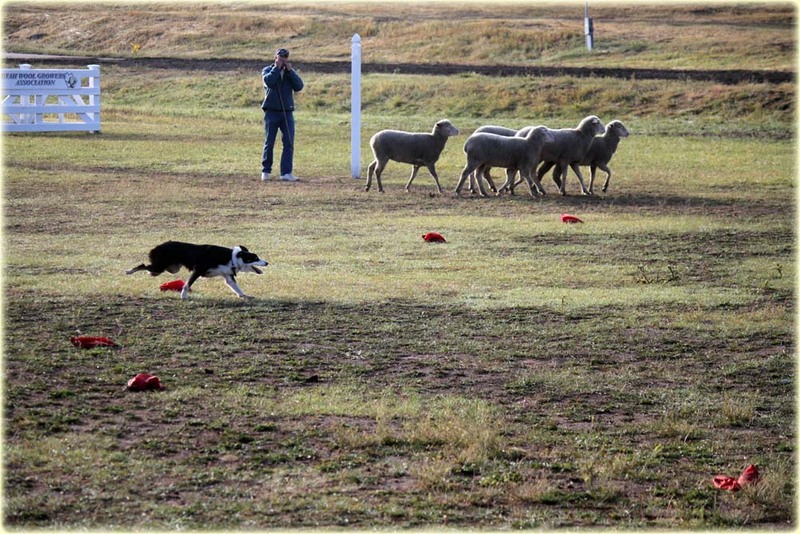 Unfortunately, the judge deemed June's grip unnecessary because the sheep were moving at a good pace and she was called off for a grip. Tomorrow Scott runs Don at a good time in the morning. 5th up. Fingers crossed. 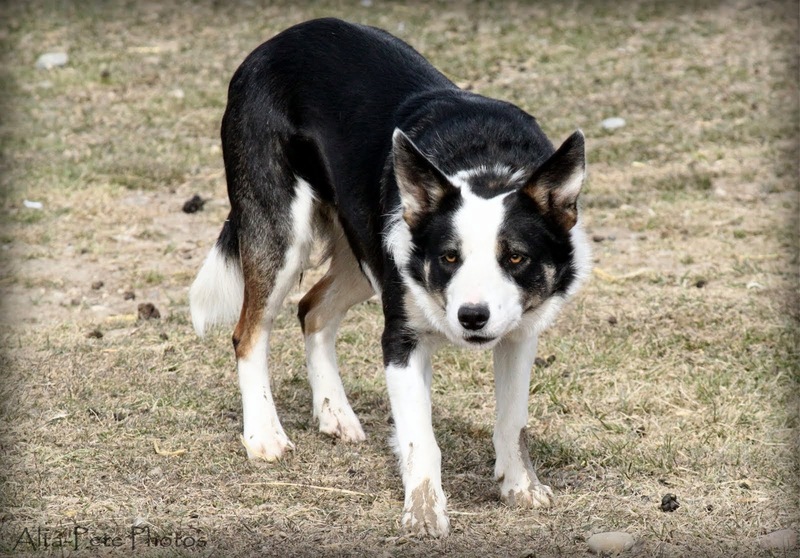 Laddie runs in a not so great time (but we've done well in this spot before) at 29th. I was privileged to see a screening tonight of Andrew Hadra's sheepdog documentary, Away To Me. We were invited to see it at Robert Redford's Sundance resort about 20 minutes from Soldier Hollow. After a delicious dinner at the Foundry Grill in the resort, we saw the movie in a screening room. Away To Me was filmed primarily at last year's Soldier Hollow and I had talked to the director several times about the picture so I was eager to see what it had developed into. 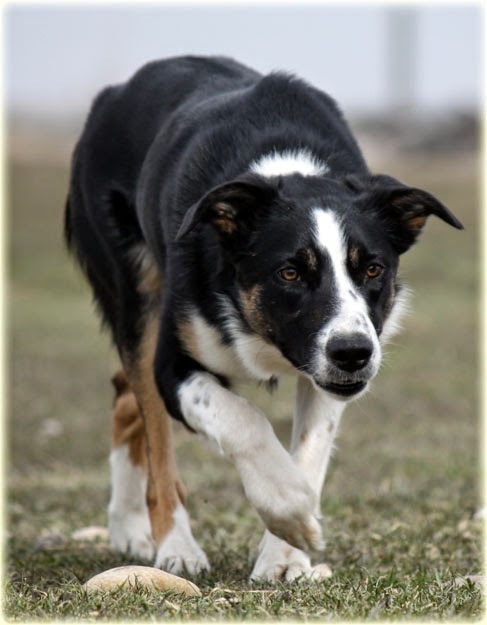 The opening of the film is an early black and white British newsreel about a sheepdog trial. It's entertaining from a handler's point of view to watch the kneeling competitor direct his dog to put sheep in a pen that he was standing a few feet away from - not holding on to a pen rope. In an interview, the handler turns out to be the great Alex Miller. The film then turns to modern day. 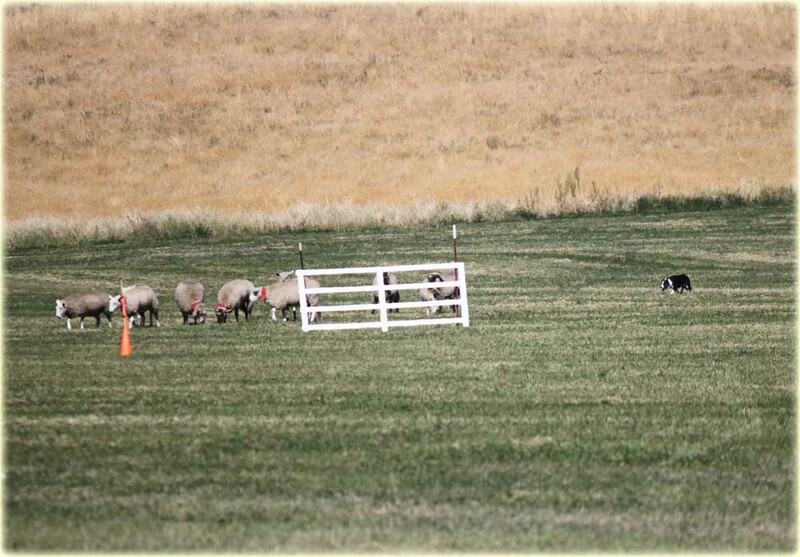 It follows three sheepdog handlers from three different countries to their destination at the Soldier Hollow Classic Trial at Midway, UT. 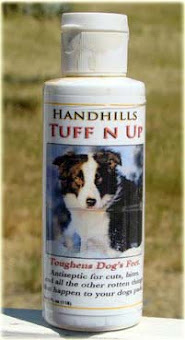 Although this movie is about sheepdog handlers, it's not really about the dogs. 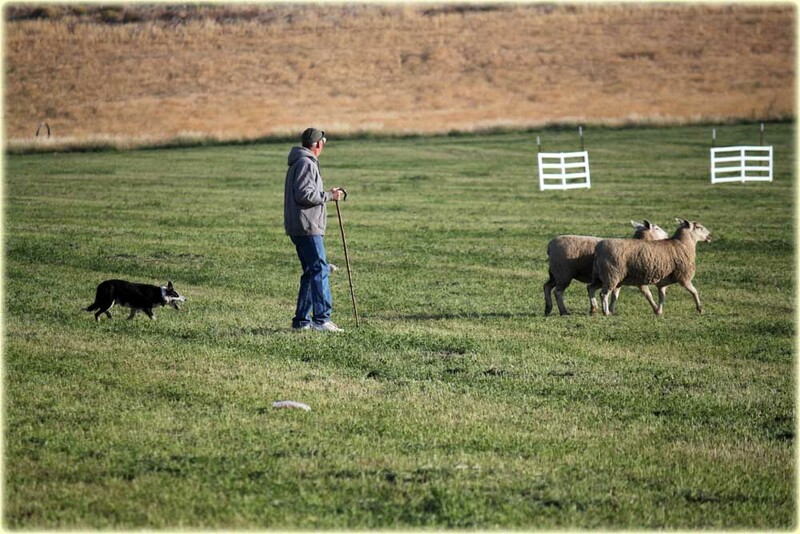 It is more about these three people from different places who's lives are shaped by their love of herding. 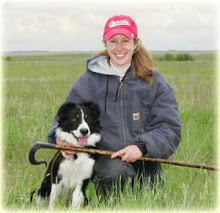 Amanda Milliken from Ontario, Canada is eccentric and humorous at her beautiful farm. There is no doubt that Amanda's dogs are well loved and the center of her life. Faansie Basson from South Africa, is composed and noble as he speaks about his daily work that is dependent upon his dogs. The heart of the film is Hailey Howard, from Northern California. 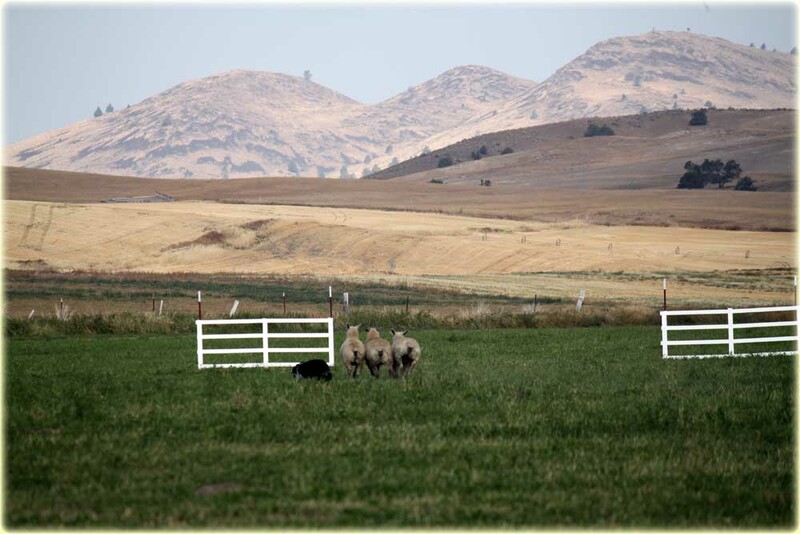 Hailey's class and beauty are accented by the great vistas of the mountains and high desert of her home. We feel like we are her best friend as she shyly tells us of her courtship by her cowboy fiance. In the background of these characters is their bond with their dogs and it's this that brings them all together. 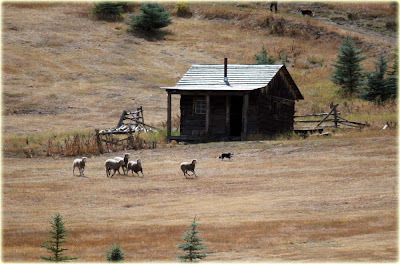 The film has some beautiful images of the world that these handlers live in with a strong Western thread. 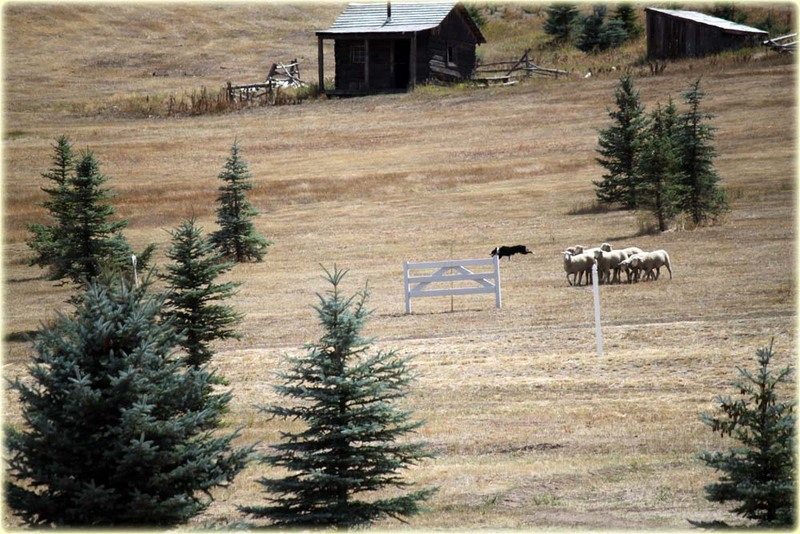 The climax of the film is at the Soldier Hollow trial and we are led along with their runs by the great narration of Ray Crabtree as he explains it for the spectators at the trial. 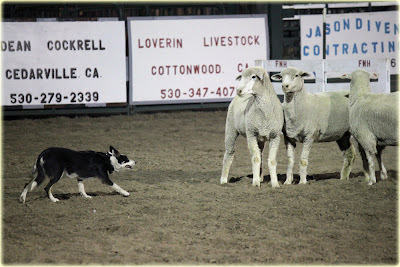 I didn't see anything in this film that a handler would think was a bad representation of our sport and the three handlers were presented with dignity and even though I knew each one of them, they felt like characters in a story that I was enjoying following. 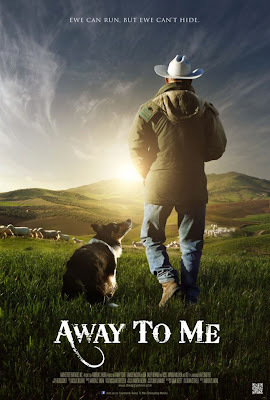 The director, Andrew Hadra is hoping to take this film to some of the big film festivals around the world and then it will be available for you and me to buy on DVD or (hopefully) rent on Net Flix. Have patience, but keep checking the website for screenings near you or instructions on how to get a DVD of this enjoyable film! 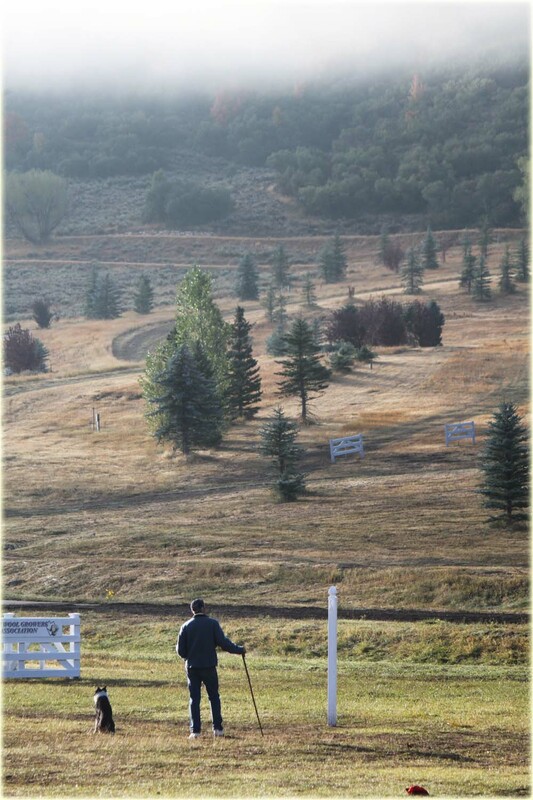 We are in Northern California at Geri Byrne's place for Scott to do a clinic. 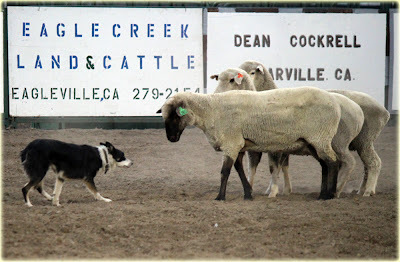 A couple of weeks ago, Geri asked us innocently if we'd like to go to a fun arena trial in Cedarville the night before the clinic. Sure, I said. I mean, Scott and I are pretty good at arena trials. 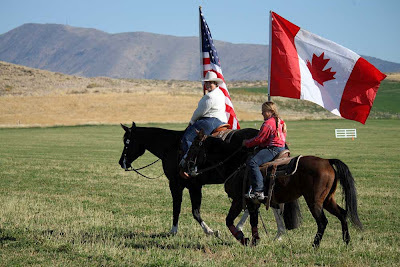 He won the Calgary Stampede twice and I was Reserve Champion once. I was sure we could do a good showing at this little trial. When I got there, I looked at the course drawing and said to someone, "Are we supposed to have the sheep go around the handler at the post?" I was told, "Whatever you want to do. There are no rules." So then I asked someone else, "When does the time start? When the gate closes or when you send your dog?" I was told, "When the gate closes. Just kidding. I'm making that up. No one really knows." So this is just for fun then? There was a swell belt buckle up for the winners of each class. Geri proudly showed me hers from last year with her Danny dog. No way was I getting that. Scott and Donnie went out to show us how it was done. Well, they showed us better than I did. 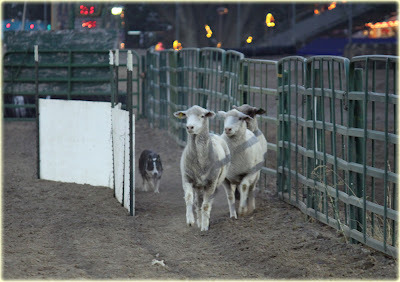 They did actually make it to the pen but the sheep had no ideas about going in. 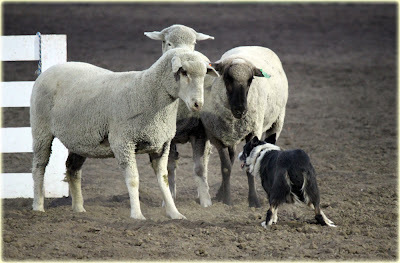 He had one Suffolk ewe who kept threatening to hit Donnie but she was all bluff. Trouble was, when Don called her bluff, she kept trying it again and again. She was very odd (to be nice). There wasn't really supposed to be grips but if your dog was appropriate and hit a ewe that was looking at him and didn't hang on, you could stay on. Donnie had a couple of hits. I didn't let Laddie bite until we were informed we had only 30 seconds. Then I told him to but it didn't make much of an impression on them. I'm sure you all know how June's run went. I said "appropriate grips that didn't hang on". June hit a shoulder, for a bit of a drag. She moved on in the course and made her first couple of panels before the judge decided he just couldn't live with it and called her off. Oh, well. It was only $10 to enter. Scott and I were totally shut out of the prizes but our host Geri managed to run off with the second and 3rd place dog collars. 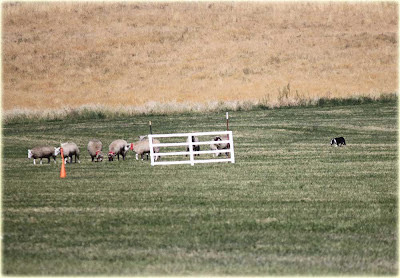 Then 5 people were chosen for an extra run to try to put the sheep in a trailer at the end of the runs. We had 3 minutes to do it. Scott and I both got picked in the random draw. Scott got them in the mouth with Don, and Laddie had them really looking in (I was running around alot to cover my side too - remember, there are no rules) but that was as far as it got. Mike Hubbard took the no rules to a new level and grabbed a sheep and stuffed it in the back of the trailer and shut the door when he had 13 seconds left. No one got the prize money but they gave Mike a dollar for his effort and creativity. 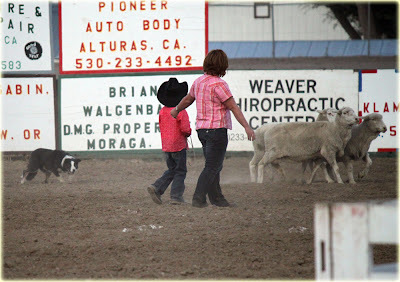 We enjoyed the kids class quite a bit and there were several mini cowboys and girls there trying their hand at the sheep. Some of them did better than me and Laddie. Lana Rowley's daughter Katie was one of them and got second place in her class (Family friend Shawna went into the arena to help her but she didn't really need it). 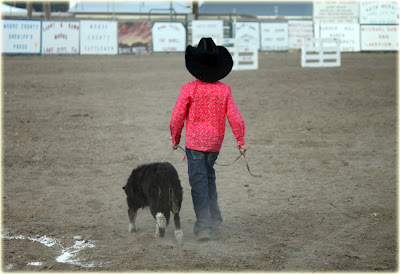 She wasn't even nervous and will be one to watch out for in a couple of years. This trial was a blast and taught me to not take every trial so seriously. Some trials are just for fun. 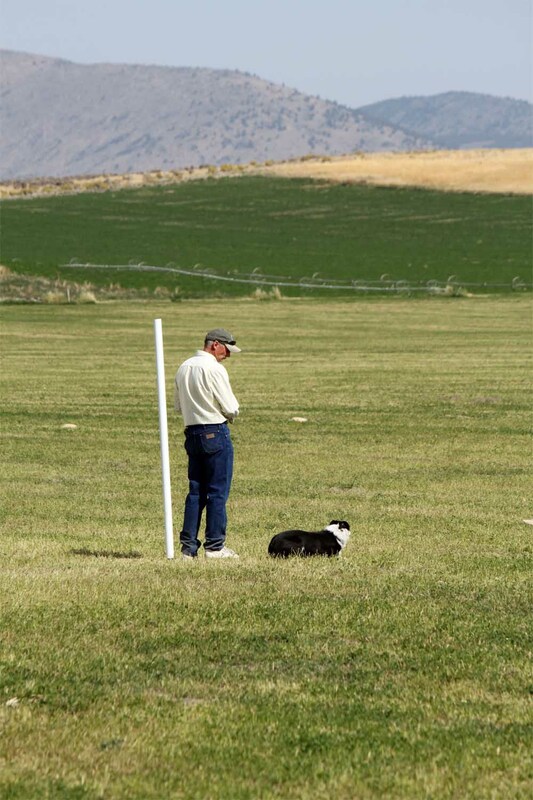 I bet this guy could have done it better than Laddie and I!